Every 30 seconds a person is killed in a road crash. That’s more than 3,300 deaths a day, and more than 1.2 million deaths each year, worldwide. As well as improving infrastructure, Global Road Technology works to educate children in the community about road safety, through its ‘road safety’ initiative. The company is currently in discussions with UAE government authorities and local companies to implement the GRT Road Safety Initiative into the country. Global Road Technology is an international road construction and maintenance company with headquarters in Queensland, Australia. 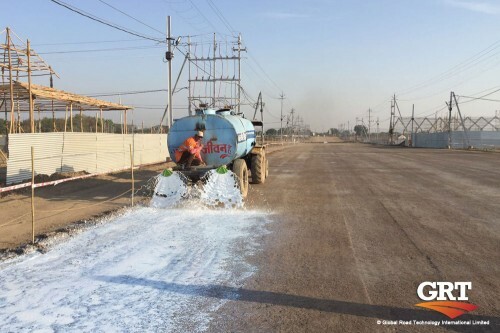 Using revolutionary soil stabilisation and dust control polymer solutions, specifically formulated by GRT engineers, GRT helps solve dust control and soil stabilisation issues to deliver total turn-key solutions for the mining, commercial, industrial, farming and military sectors as well as in developing communities worldwide. Global Road Technology works with major companies across the mining, oil and gas, military and government sectors in Australia and internationally.